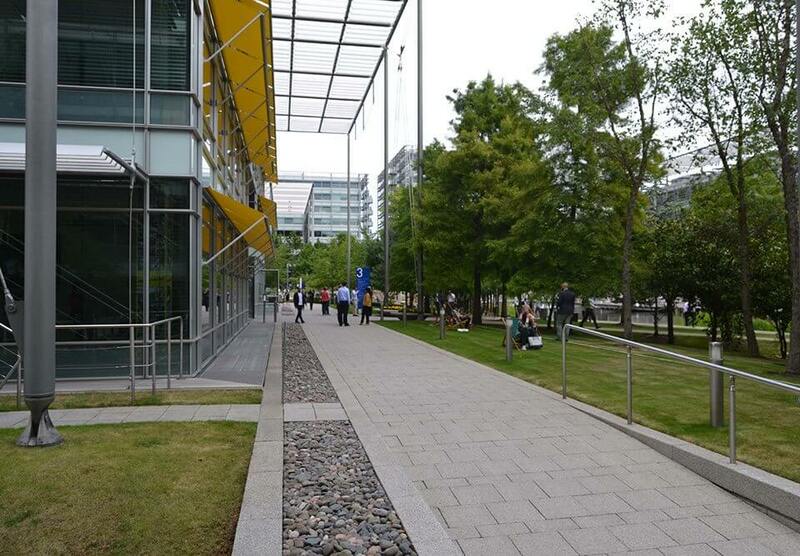 Chiswick Park is a renowned business park in London and home to some of the world’s leading companies. 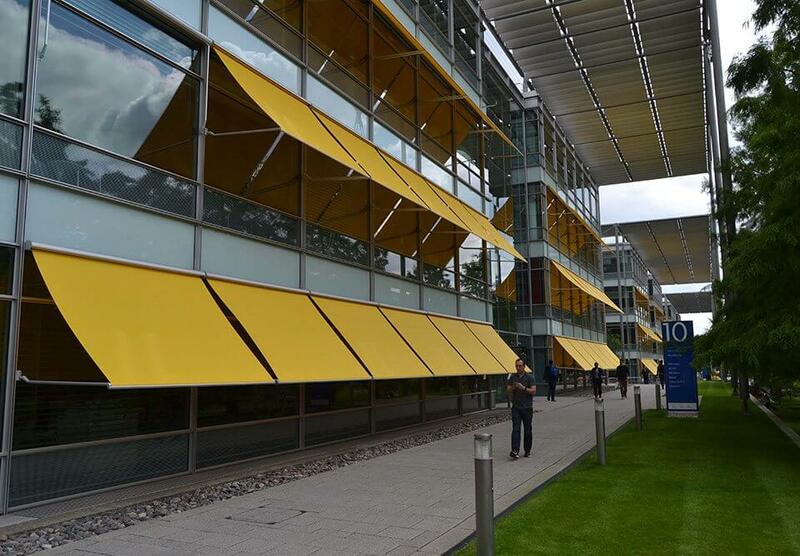 Waverley was instructed to carry out replacement of all external awnings to help retain and attract more blue-chip companies to this unique office location. The office park’s design and layout are based on the belief that if people enjoy work they do better work which leads to better more successful businesses. The huge office complex contains beautiful parkland and boasts its’ own lake, waterfall, gym and a selection of cafes and restaurants. The modern glass buildings look impressive but present a myriad of challenges when it comes to needing shade from the sun. The existing motorised awnings were installed at construction stage but had presented the facilities management department with continuing maintenance issues. The awning’s arms were not spring tensioned, leaving them vulnerable to damage in windy conditions. As the emphasis on staff health & well-being gathers momentum, landlords face a constant challenge to provide stimulating working environments in order to attract loyal tenants. The ability to control the effects of solar heat gain has a huge impact on the quality of the working environment and ultimately on the productivity and profitability of the business – both tenant and landlord. External shading is the most effective means of solar shading. Blocking solar energy before it hits a building’s glazing significantly reduces the ‘green-house effect’. 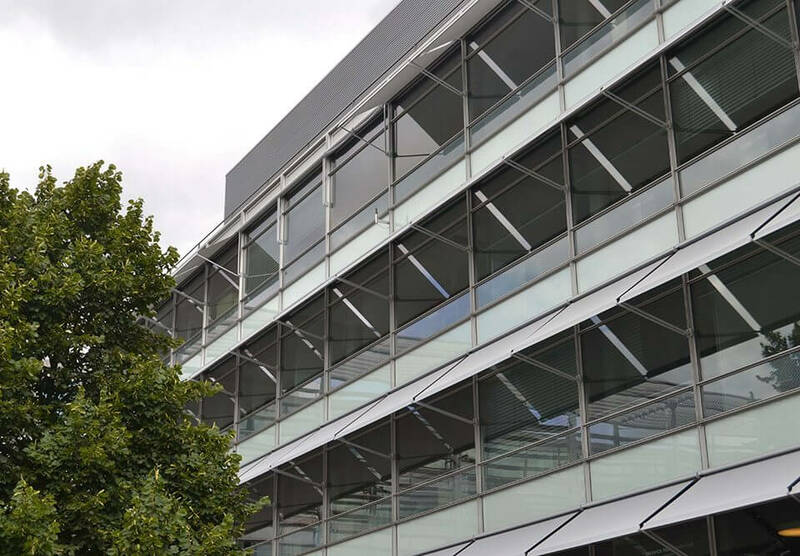 Often ruled out due to cost, practicality and fear of maintenance issues, electric awnings and external blinds can have a big impact on the look and functionality of a building. By controlling solar energy before it enters the building the reliance on air conditioning is significantly reduced cutting operating costs and reducing a building’s carbon footprint. Waverley supplied and installed Weinor Aruba motorised drop arm awnings which are manufactured to the highest standards in Germany. The spring tensioned awning arms are designed to withstand the blustery weather conditions. It is now 12 months since these awnings were installed and not a single repair issue has been reported. The awnings are wired into the building management system giving the facilities management team a high level of control of all awnings at the press of a button. Waverley carried out all of the wiring requirements using a specialist team of sub-contract electricians. The awnings are also connected to sun sensors and wind sensors. The sun sensors ensure the awnings provide maximum protection during sunny weather and the wind sensors automatically retract the awnings during high winds. The external grade, mould and mildew resistant fabric is further protected by being housed inside a cassette headbox when not in use. All of the awning hardware is powder coated to colour match the building façade and is almost unnoticeable when not in use. All of the awnings were installed at weekends to minimise disruption to building occupants. Powered access equipment was used to install the awnings. All Waverley installers are trained and have IPAF licenses to carry out this type of work. 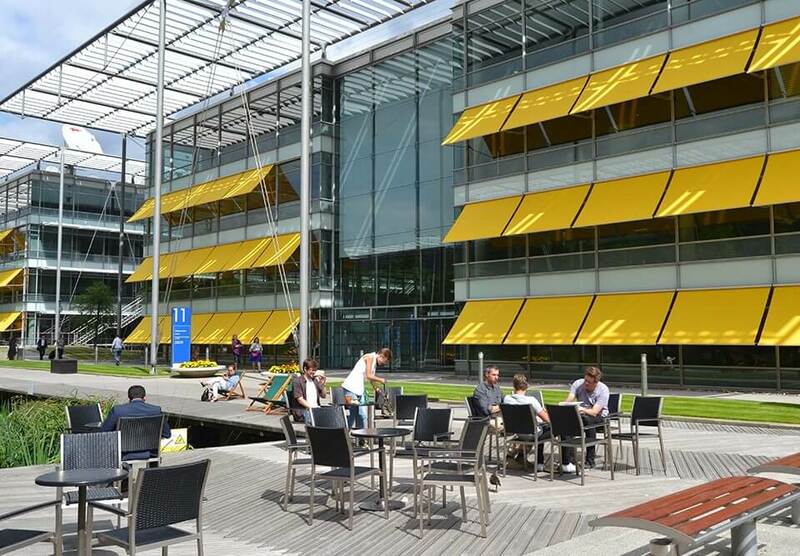 The end result is a visually stunning solar shading solution that is highly effective at reducing heat and glare in the offices. What is solar heat gain? Read our blog to learn more.